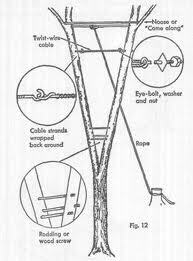 HAZARD TREES are trees with parts that are likely to fail, especially during periods of high stress events such as wind and ice storms. Trees or parts of trees may fall and cause injury to people or damage to property. We call trees in such situations "HAZARDOUS". 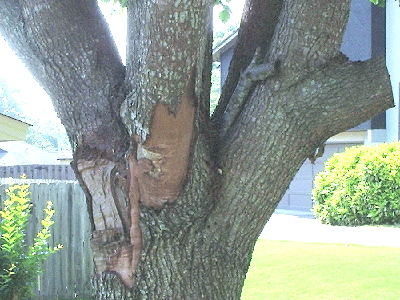 Regular tree care will help identify hazardous trees and the risk they present. 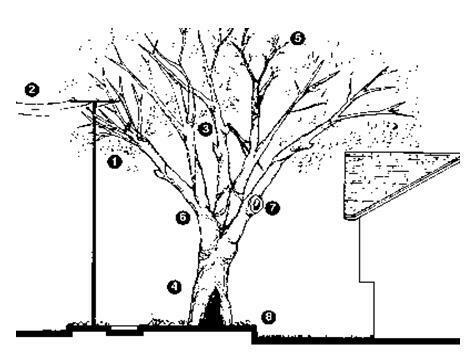 Once the hazard is recognized, steps may be taken to reduce the likelihood of the tree falling and injuring someone. More severly damaged trees will need pruning and even additional support such as cables or braces. 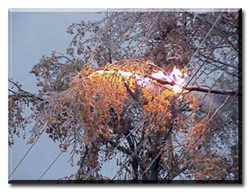 Storm damage situations can present some of the most dangerous working conditions both in the trees and on the ground. Pruning or removing trees, especially large ones, can be particularly hazardous work. This type of work is best left to the professionals. A Certified Arborist is a specialist in the care of trees. Certified Arborists are knowledgeable about the needs of trees, and are trained and equipped to provide proper care. 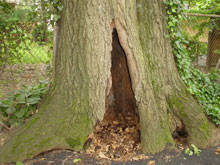 Knowledge of tree care and tree structure can prevent damage to property. PREVENT POWER OUTAGES AND ROOF DAMAGE. Our Certified Arborist are specially trained in pruning hazardous limbs growing and hanging over structures and service lines, that provide electricity to your home.